Great Street Food Ideas For Food Trucks This Year - Nisbets Australia Blog - Industry news, trends, recipes and more! Remember the days when burgers meant a patty, a bun, lettuce and ketchup? Well, welcome to 2017. This year it is all about upping the game in serious style. Cast your thoughts to gourmet burgers and sliders – the fancier the better! Right now, it’s all about what looks good and tastes even better. If you handcraft your delicious bites to perfection, your custom is soon to be booming. Think about infusing your meats with something special, such as a soft blue cheese or herbs and spices. Adding upscale ingredients like avocado or crispy salami will make your burgers a cut above the rest. Hot dogs are big business too. Gourmet of course. You can infuse them with garlic and herbs to make them special. If you want to make your hot dogs extra appealing, make them out of upscale meats such as chorizo. The profits are endless too, with the options to add sauces, onions and cheese. If you wish to make your hot dogs the best in town, why not whip up some homemade relishes and sauces to get taste buds tingling. For something a little bit different and extra tasty, courgette and tomato work great together. Red peppers make great relishes too. Another big food trend to consider offering is Mexican food. Whilst this cuisine has always been popular, it is certainly reaching its peak right now. And, even better, Mexican dishes are super easy to make. You can sell delicious tasting food with basic ingredients to make many dishes, such as tacos, burritos, chilli and enchiladas. It is a sure-fire hit. For that extra special touch, add upscale and delicious ingredients such as salted beef, chunky salsa and plenty of overflowing, juicy sauce that begs for a napkin. With the ever increasing popularity of vegetarianism and veganism, ignoring this market is a foolish thing to do. We're not talking about the one or two options. We're talking about several dishes, which allow vegetables to take the main stage. The possibilities are endless, and you can even add the spices, herbs and other flavours you would use in your meat dishes. Although not a food, smoking is going to continue to be big in 2017. With the focus on meats these days shifting to being higher in quality and cooked better, smoking has become a massive hit. It is a method which is going to be popular for a long time thanks to the great taste it gives. Smoking brisket and pork for 18 hours is a great place to start thinking. From there you can add flavours such as salt, pepper and sweet and sour notes to complete the taste to perfection. Charing is even bigger than smoking food. It shows no signs of losing popularity in 2017. It is a logical and great idea to introduce this cooking method onto your menu. It will expand your food options. It will be new, exciting and appealing for your customers. It will work. If you are looking for something other than meat to char, tomatoes are a good starting point. The smoke really brings out the flavour and is great as a side dish or even as part of a main dish. The other great thing about eggs is that they are super versatile. As well as creating a menu that revolves around them, you can also add them to dishes which you already sell. For egg based menu items there are a wealth of things you can create. What about placing on falafels, tortillas and pittas? Make the egg big, attractive and the centre of the dish. Eggs are also the perfect ingredient to top on salads to turn them from mundane to something spectacular. For all your leftover ingredients, think about mixing them into an egg tortilla or even into an eggy bubble and squeak. You can also add eggs to dishes that you already sell. If you are selling burgers on your menu, this is a prime opportunity to make your menu more gourmet. One mouth-watering idea is an egg on top of a beef burger with bacon, cheese and all the trimmings. A delicious burger in its own right, this added ingredient will turn it into a show-stopping piece. Sure to be a hit with customers. Equally as important as food, is drink. Over the past five years, the juice and smoothie industry has been at an all-time high, and it shows no signs of slowing down. Customers always want healthier options - juices are a great way to tap into the market. Now, you can go two ways. You can make your truck solely a juice bar or you can add to your drinks menu – providing you have the space. This option gives customers the choice to buy a juice if their friends are going for a food option and they do not want to eat. The menu items can be endless as fruits occupy little space which works well for the lack of room food trucks have. The rise of people drinking coffee has increased with astonishing speed. Introducing coffee on your menu is a great idea. Now, we're not talking about your standard americanos or lattes. We're talking specialty coffees. If you want a menu that is not sub-standard then it is time to get serious about your beans. By selling special blends that have unique flavours, you can up your food truck game. You could also pair certain coffees with your menu items dependent on the flavours. A great way to increase both food and drink revenue. We have recently published a piece with low cost coffee hacks and it is great for some tips and tricks to start you along your way. Think hot chocolate was for childhood memories? Think again. The market is now focusing on customers who are wanting much more than a chocolate and milk drink. Upscale versions are becoming popular, using premium ingredients. High quality chocolate, raw cacao and spices are now common ingredients. Caramel strands, marshmallows and thick, fluffy cream are now indulgent toppings. The options are endless. Adding alcohol is another popular road you can choose to take. The great thing about these hot chocolates is that you can sell them as dessert options. Adding churros or biscuits on the side is great for a dipping sensation. Now you've read how simple it is to create a variety of street food, there is not much that can get in your way. 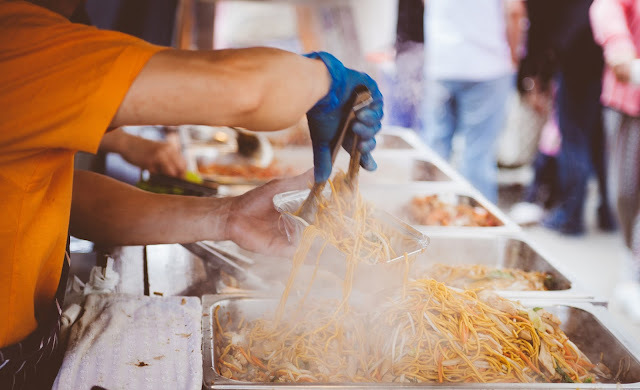 The popularity of food trucks show no signs of slowing down, and will help you branch out to a whole new customer base like you have never seen before.